After 10,000 hours of systematic training with the world's best coaches, this lizard has learned how to nail its prey. Moving Players In and Out. 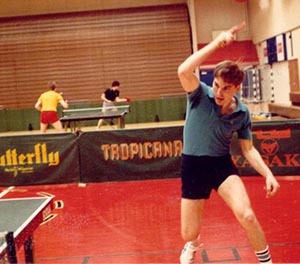 I'm often amazed at how the world of table tennis is divided between two types: those who use the full power of topspin in their games, and those who don't. This doesn't mean looping every ball, but it does mean using topspin to control your offensive shots and often your defensive ones as well. Even when doing simple forehands or backhands a little topspin goes a long way. I know; I sometimes hit the ball too flat and pay the price. At the highest levels, many top players don't even bother to smash - even if the ball is eye-level high, they loop. However, for most players, a smash is a must. Here are some keys to developing a good smash, forehand or backhand. First, get some coaching or watch the top players. Here's a tutorial from PingSkills (3:58) on the forehand smash, and here's Tahl Leibovitz demonstrating the backhand smash (1:35). It's still best to work with a coach who can figure out and fix any flaws in your technique. Second, practice. Here are two of the best smashing drills. Both Over- and Under-playing are scourges of match play. I'm not sure which happens often. I'm guessing most would say they lose more often from under-playing down to a "weaker" opponent, but I’m not so sure. Players often lose by over-playing, but don't realize it. Under-playing means you play down to the level of your "weaker" opponent. It usually means that you hold back on your stronger aggressive shots, playing a safer, passive game that allows the opponent to take control and often win. It's a quick way to blow a rating or ranking. Perhaps the biggest change at the higher levels in table tennis in recent years is the advent of the backhand "banana" receive. This is the nickname used for a backhand topspin flip of a serve, essentially a mini-loop, with the name referring to the curve the racket goes through with the stroke. It's done against any type of spin, but it's against short backspin that it is most effective. Some do it with straight topspin; most can add sidespin. It's much easier to do this type of shot on the backhand than the forehand, where the wrist is more locked, and so more and more players are covering more and more of the table with this backhand shot. At the U.S. Olympic and World Team Trials this past weekend (Feb. 9-12), it was the receive of choice of nearly every player. Some players used it nearly every receive they could. Others mixed it up with short pushes. The ones who didn't use it much were thought of as "old school," while all the younger players used the banana flip over and over. Here's your Ping-Pong Champion Valentine! Due to getting in late last night, and a nearly continuous headache since Friday (the causes of which I'll blog about), I'm going to go back to bed and start blogging again tomorrow, including the Tip of the Week. I'll have lots of tidbits from the USA Olympic Trials. Meanwhile, here's an article in today's USA Today on the Trials. I'm off this morning to coach at the U.S. Olympic Trials (Cary, NC, Feb. 9-12), so no blog entries the next two days. See you all again on Monday - hopefully with lots of news from the Trials! He's been playing only about six weeks. Last week he learned to loop for the first time. Normally I start players looping against backspin with multiball, but he'd seen others looping against block and wanted to try it, so we started with that. Apparently he practiced it all week. Yesterday he showed up, and he's looping against my block like a pro! He lets the ball drop very low, since he's very short, but he was getting very good spin with textbook technique. Wow. Can't wait to see how he develops. Convention wisdom says that nets and edges even out. As I've pointed out before in this blog, this simply isn't true. Some players get more or less than others, either because of their playing style or because of their precision. It doesn't always even out.